Summertime at the shore in New Jersey is one of those simple pleasures - the salt air, sand and sea, family, freinds, relaxation, the architecture, the beaches, and of course the famous bed and breakfasts around Cape May. Cape May New Jersey is a historic seaside resort, at the South Jersey Shore. 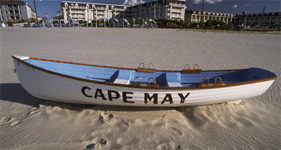 Cape May is known for its broad, white sand beaches, architecturally beautiful Victorian hotels and intimate lodging. We are just a short stroll to the picturesque Victorian town and Washington Street Walking Mall with its interesting array of shops and innovative, fun, fine and family dining. From Colonial cozy to Edwardian luxury to the modern-day conveniences at the classic beachfront motel. Most accommodations are within walking distance of the beach, easy access to the Washington Street Mall, and provide a variety of amenities suited to make your stay here a perfect in every way. Take a step back in time without losing any time. When you stay at a B&B, you enjoy the luxury of being surrounded by period antiques in the Victorian or Edwardian style and the hospitality and camaraderie of breakfast and, in many cases, tea, often served in the British style. Happily, you need not sacrifice the amenities of the modern age just because you’ve taken a short holiday from it. 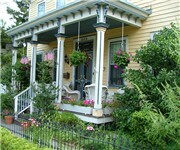 Queen Victoria Bed and Breakfast - Cape May, NJ – Experience exceptional hospitality. Welcoming guests since 1980, The Queen Victoria® Bed and Breakfast is renowned for extraordinary service and great attention to detail. Be assured of superior accommodations adhering to the strict and high standards of Select Registry, Distinguished Inns of North America. Savor a generous breakfast served buffet style and afternoon tea in the British fashion with decadent sweets and savories served on the porches or in front of a glowing fireplace. Thirty-two inviting and romantic rooms and suites with private bath are decorated with period antiques in the Victorian style and tradition of an historic Cape May bed and breakfast. Inn rates include full breakfast and a delicious afternoon tea with sweets and savory in the British fashion. Bayberry Inn - Cape May, NJ – Escape to Bayberry Inn, a Cape May Bed and Breakfast. Experience the ambiance and serenity of a by-gone era in one of the most romantic and historic homes in Cape May, NJ. Whether for a romantic getaway, or a vacation with best friends, you’ll receive exceptional hospitality at the Bayberry Inn. Your hosts, Andy and Toby are natives of the area and glad to share ideas and suggestions for places to go and things to do. We are just two blocks from beach and one block from the Washington St. Mall. As a matter of fact, we received the Arrington's B&B Journal Award for "Best B&B for walking to shops and restaurants " in 2005. 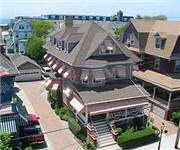 Beauclaires Bed & Breakfast Inn - Cape May, NJ – Beauclaire's is a renowned Victorian style Bed & Breakfast open all year located in the historic district in Cape May, New Jersey. Just a half block from the beautiful Cape May beaches, and two blocks from the center of town where you can enjoy antique shopping, gourmet dining, and historic Cape May tours. All of our romantic guest rooms have private baths and are decorated with period antiques in the Victorian style and tradition of an historic Cape May bed and breakfast. 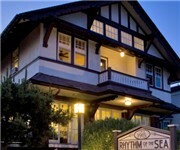 Rhythm of The Sea Bed and Breakfast - Cape May, NJ – You will be drawn to the Rhythm of the Sea, our 1915 Craftsman-style Inn, by Genuine Hospitality, Good Food and Gemütlichkeit. With the ocean as our front yard we offer a wealth of seaside activities. If you are looking for a romantic B&B stay whether for a special occasion, the Cape May Jazz Festival, the Food and Wine Festival or any of the Tours and Events offered in Victorian Cape May, such as birding, MAC tours, then all this and more welcome you at our ocean front Boutique Bed and Breakfast. Our intimate accommodation is located on the beach, in sunny Cape May, New Jersey where the only thing we overlook is the Atlantic Ocean. Leith Hall Historic Seashore Inn - Cape May, NJ – Ocean views, large porch with rocking chairs, Restored 1880s Victorian, near beach and shops, delicious breakfast & afternoon refreshments. Your hearty Victorian breakfast is served from antique silver and Royal Worcester china. The aroma of freshly brewing coffee and home baked breads wakes you up while quiches, crepes and egg entrees fortify you for the day. We offer beach chairs and towels if you’re heading for the surf. We offer directions and advice if you’re looking for antiques. Perhaps best of all, we offer a beautifully restored parlor and library and a large wraparound porch if you’re planning on doing absolutely nothing. There’s a Victorian cabinet grand piano if you’re feeling musical.hundreds of books if you’re feeling literary and extremely comfy chairs and ottomans, if you’re feeling like a nap. Gingerbread House B&B - Cape May, NJ – The Gingerbread House Bed and Breakfast is located in the heart of Victorian Cape May's historic district, the Gingerbread House is less than a block from the beach and promenade and merely two blocks from the Cape May Victorian Mall. Cape May's attractions and finest restaurants are also within walking distance. Built in 1869, The Gingerbread House is one of the original Stockton Row Cottages. This carpenter gothic style house was designed by the famous architect, Stephen Decatur Button. Originally, The Gingerbread House was a summer retreat for wealthy families who, together with their servants and nannies, would travel from Philadelphia and Virginia to summer in Cape May. Since 1979, The Gingerbread House has been among the finest bed and breakfast inns. The Abbey - Cape May, NJ – The Abbey Bed & Breakfast Inn offers elegant accommodations with full breakfast and afternoon tea amid Victorian antiques. While the furniture is formal the attitude is unpretentious. Seven rooms in a restored Gothic Revival Villa. Located in the historic district of Cape May, New Jersey. The Summer Cottage Inn - Cape May, NJ – The Summer Cottage Inn was commissioned to be built in 1867 by Samuel Harrison as a family summer vacation cottage in historical Cape May, New Jersey. It was designed and built in the Italianate style by the renowned architect Stephen Decatur Button. The Summer Cottage Inn Bed and Breakfast offers the perfect year-round getaway. Treat your family to a Cape May vacation or a special someone to a romantic, relaxing retreat. We have all the modern conveniences and attention to detail to make your stay comfortable. Windward House Bed and Breakfast - Cape May, NJ – The Windward House in wonderful Cape May, NJ is a gracious Edwardian style seaside Bed and Breakfast inn with a tradition of hospitality and comfort for over 30 years. This restored inn is located in the heart of the historic district on Jackson Street, the oldest street in Cape May. It was built during a period when rooms were large, spacious and airy. To capture the summer sun and shade, this comfortable inn has three porches - a wraparound front porch filled with wicker, a second floor porch which is private to two special guest rooms and a third floor sundeck. All guest rooms have antique queen size or king size bed sets replicating the comfort and luxury the Victorians loved in their bedrooms. Saltwood House - Cape May, NJ – Ideally located mid-block on Cape May’s oldest street, this meticulously restored and authentically furnished 1906 Inn captures the essence of a historic private residence, with all the modern conveniences to make your stay both comfortable and memorable! Built in 1906 for local real estate magnate Charles Campbell and his family, the Saltwood House is a gracious Victorian home retaining much of its original charm. Saltwood has been meticulously restored and authentically furnished. Every effort has been made to give the house the ambiance of a historic private residence. The look is bright and airy; the colors are warm; the feeling is open. The Mason Cottage - Cape May, NJ – The Mason Cottage is a lovely country Victorian Bed & Breakfast located in the historic town of Cape May, New Jersey. Our Cape May NJ Bed and Breakfast is just one block from the beach and promenade and 2 blocks from a plethora of fine shops and intimate restaurants. Built in 1871 as a private summer residence for Edward A. Warne, a wealthy Philadelphia entrepreneur, the Mason Cottage is the perfect getaway for guests who appreciate the peaceful and charming lifestyle of a by-gone era. The Mason Cottage is endowed with lofty ceilings, full-length windows and a sweeping veranda, all so characteristic of Victorian homes of the period. The Virginia Hotel - Cape May, NJ – The Virginia offers 24 intimate rooms in the main house and 5 spacious cottages along Jackson Street, the crowning glory of Cape May's historic district. 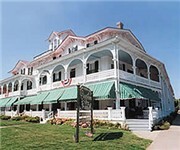 The Virginia Hotel is an impeccably restored 1879 landmark building and is the foremost luxury hotel in Cape May NJ. Nestled on Jackson Street in the heart of the famed historic district of Cape May New Jersey, the Virginia Hotel offers its guests a flawless integration of service and style, with a timeless glamour. The well-appointed guestrooms in our Cape May hotel accommodations evoke modern luxury and contemporary comfort. Rooms are soothing, refreshing, plush yet simple: signature beds with Italian and Belgian linens, flat screen televisions and an assortment of Bulgari products. "Luxury and comfort are foremost when staying at our Cape May, NJ hotel accommodations. Mainstay Inn B&B - Cape May, NJ – 'The jewel of them all has got to be the Mainstay,' according to the Washington Post. Built by a pair of wealth gamblers in 1872, this elegant, exclusive clubhouse is now one of the premier B and B inns in the country. Guests enjoy 12 antique filled rooms and suites, three parlors, spacious gardens and rocker filled verandahs. Breakfast and afternoon tea daily. Beautiful beaches, historic attractions, biking, birding, golf, and tennis. Since 1976, visitors have been able to enjoy the same grand spaces, with fourteen foot ceilings, and museum quality antiques. The Chalfonte Hotel - Cape May, NJ – The Chalfonte Hotel features luxurious suites, beautiful rooms with private baths and economical rooms with baths down the hall, the newly renovated Chalfonte hotel is an experience in historic accommodation, loved by generations of vacationers at every price range. Built in 1876 by Colonel Henry Sawyer, the Chalfonte is Cape May's enduring historical site as the oldest continuously operating hotel in the National Historic Landmark city. Mooring B & B - Cape May, NJ – The Mooring Bed & Breakfast is a Cape May, New Jersey, Bed and Breakfast only one block off the beach. The Mooring, in Cape May's historic district, offers nine uncluttered guest rooms and two suites, each with private bath, air-conditioning, period furnishings, and more. Comfortable elegance in a classic Second Empire inn, the only Cape May B&B originally built as a guest house. We offer nine uncluttered guest rooms and two suites, each with period furnishings, private bath and air conditioning ... a few with ocean views, two with private porch and not too many with TV. Bedford Inn - Cape May, NJ – This Cape May Bed & Breakfast, originally built in 1883 as a "Mother Daughter" twin home for the Page family, now caters to vacationers looking for relaxing and romantic getaways. The Bedford Inn is well located in Cape May, New Jersey just a very short block to the beach, near many fine restaurants and shops. The Bedford Inn, a Victorian Bed and Breakfast, is open all year round and provides the setting for the perfect romantic getaway where you can leave your hectic lifestyle behind. 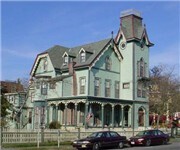 Elaine's Victorian Inn - Cape May, NJ – Elaine's Bed & Breakfast. Located in the very heart of Victorian Cape May, NJ. Two blocks from the beach. One block form the quaint Washington Street Mall. Within walking distance of all of Cape May's attractions. Each room features individual climate control at your fingertips, private hand tiled Victorian bath, cable television and impressive queen size beds with pillow-top mattresses, buried beneath clouds of pillows, duvets and comforters. Each room is completely unique and lavishly furnished. Victorian Lace Inn - Cape May, NJ – The Victorian Lace Inn in Cape May, NJ is a classic, cedar-sided bed and breakfast inn by the sea. Sip morning coffee on our old fashioned front porch and enjoy the sea breezes and ocean view. In the cooler months, cuddle next to a fireplace in one of our spacious suites. The inn has beautifully restored pine floors and floor to ceiling windows. Two of our guest suites. We also own the famous Cape May Day Spa, named Best of the Shore by Philadelphia Magazine and Best of NJ Monthly Magazine! Bayberry Inn - Cape May, NJ – The Bayberry Inn is located in Cape May, N.J., one block from the Washington Street Mall, shops, restaurants, and theatres. The inn is two blocks from the beach. The Mid-Atlantic Center for the Arts offers walking, boat and trolley tours of Victorian Cape May one-quarter mile from the inn. Built in 1856, this Victorian-style inn features a greenhouse filled with orchids displayed throughout the home. Complimentary three-course breakfasts are served each morning in the dining room, featuring stuffed French toast and specialty omelets. The Bayberry inn offers five guestrooms decorated with period furnishings. All units include private bathrooms providing bathrobes, and the Bayberry Suite features jetted tubs and a heated tile floor. 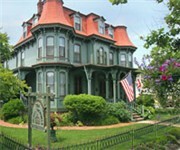 Angel of the Sea B&B - Cape May, NJ – Welcome to the Angel of the Sea, Victorian Cape May's most elegant bed & breakfast. Located one half block from the beach in the quiet East end of town, the Angel offers the discriminating traveler a chance to experience the charm of a bygone era while enjoying an array of modern amenities. Each of the 27 guestroom at the Angel, is uniquely furnished in Victorian style and each room has its own private bath. About a quarter of our rooms have ocean views, but all guests have access to common porches and balconies that wrap around the front of our twin houses. Every room at the Angel has cable television and wireless internet access is offered to all of our guests. Books and magazines are available in our common areas, as well as a selection of board games.